Scroll down this page to see a random sampling of streets for all occasions, we've mixed them up so that you can easily see and compare the differences, versatility, and limits of each size of art print. After you have reviewed these samples you are welcome to go back to the samples menu page to see more samples by size and occasion. For pricing and ordering details click here. Take a look at what we've done for others and imagine what we can do for you! This is a typical 8 building 25th Anniversarry street. We include the appropriate 25th silver (shown) or 50th gold inner mat at no extra cost. 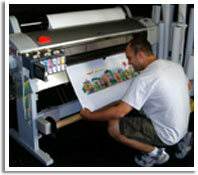 Your Memory Lane art prints are custom made for each customer and created by the information that they provide in their "information list". We do not use clip art, each street is totally unique. Above: 5-Building (25th anniversary) This gift from the children shares their most memorable moments and memories as they were growing up. 5 Building (anniversary) A submarine on the street? Why not... it's about memories, not realities! If you are interested in seeing more military streets please click on the tab in the top menu "View All Art Prints" and select "Military retirement". 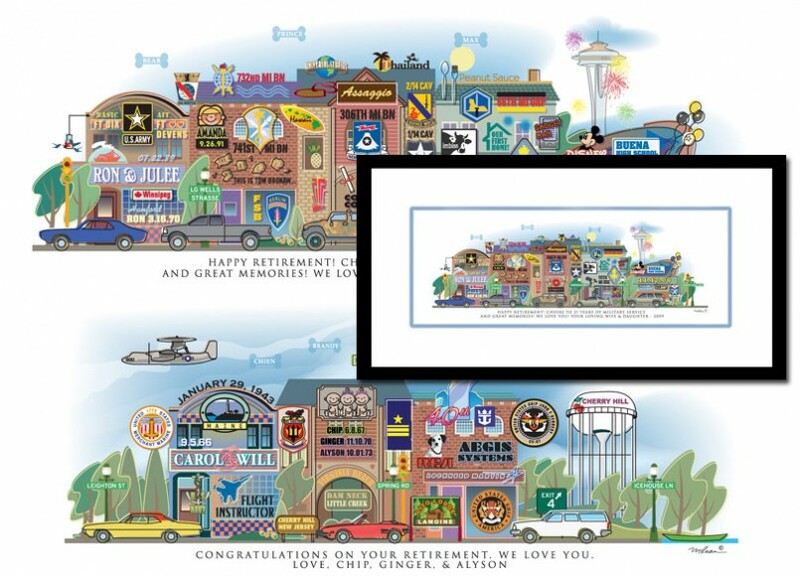 5-Building (farewell / retirement) The Saint Louis Blues (NHL) used our prints as the traditional farewell gift to any players that were traded or retireing. Each print was 40% complete, then 60% personalized for the particular player and family. It showcased the important events and experiences while living in St Louis. 5-Building (wedding gift). As you look through our samples please remember, these are very high quality art prints... 99 year inks, much better color and much sharper than what you can see on your monitor... guaranteed! Load time doesn't allow is to have too many samples on one page... if you want to see more examples of our work please use the link at the top of the page (View All Art Prints), you'll see anniversary, corporate retirement, birthday, graduation... all kinds of examples and categories. 8-Building gift of appreciation. This Detroit "Hockey Doc" generously devotes his free time to youth hockey as the league doctor. He provides free physicals, medical assistance and often takes the teams out for food after the games. This was a gift of appreciation from the parents and players who have quickly become his fans. 8-Building (birthday). This was the 40th birthday gift for Ellen Degeneres from her produces. 8-Building (corporate retirement). Remember, our street prints work for any occasion because you theme them by the kind of information that you tell us, also you create the dedication line that runs under the art. This is a 2 building street, a gift from the baseball team to the coach. Orders placed today, with a completed Info List, can be ready to ship in as early as 30 days. Our 5-Building Street is the most popular all-occasion choice. Look through our sample pages to see how this print has been used for celebrating dating and marriage, anniversaries, graduations, birthdays, and retirements. 25th Anniversary or 50th Anniversary gift? To receive the appropriate silver or gold accent mat be sure to place your order specifically for the 25th or 50th Anniversary print. Our 8-Building Street is the largest of our street prints and great for any occasion. Look through our sample pages to see how this print has been used for celebrating dating and marriage, anniversaries, graduations, birthdays, and retirements.